Unscheduled, impromptu moments usually make the best memories and the best way to capture them all is with a second photographer. All of our packages include full-day coverage, but only the Artisan Collection and Heritage Collection come standard with two photographers. A second photographer can be added to any package for an additional fee, though many couples opt for the Artisan or Heritage because of the other value-added benefits included. Do you have more than 150 guests? Choosing a package with a second photographer or adding this feature is a HUGE benefit! A single photographer can’t be everywhere at once, whereas two can divide and conquer. During the cocktail hour, for example, I’ll be focused on your family and bridal party portraits, whereas a second shooter can capture candid images of your guests and the venue. Any time a wedding features more than one location, I recommend a second shooter. This applies to scenarios where the bride and groom get ready at different locations as well as different venues for the ceremony and reception. Traveling between locations has a huge impact on your wedding day timeline and two photographers can accomplish a lot more than one. Multiple Perspectives – Weddings, like movies, are best shot with more than one camera and from different angles. 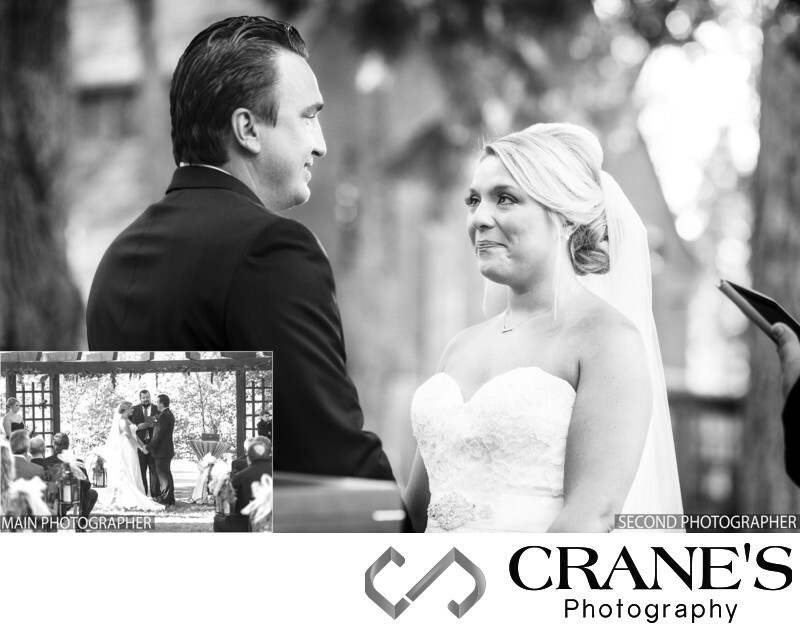 I’ve worked with my partners for years and we’ve developed a great, cohesive relationship that really enhances our ability to capture your wedding day story from start to finish. We’ll never miss a moment and you’ll love the different styles of lighting and angles that result from our partnership. Time Constraints – Despite the months of planning, your wedding will pass in the blink of an eye! There are so many important moments and we want to make sure we get all of them on camera. Some moments we can expect, such as the first dance or throwing the bouquet, but the look on your mother’s face during the father-daughter dance, or grandpa’s eyes lighting up when grandma takes to the floor, simply can’t be planned (and that’s how we want it!). There’s no doubt about it: when it comes to full coverage, two photographers are better than one. Keep the Focus on You – This one’s a biggie! Chances are we had an engagement shoot and captured some incredible photographs of you and your spouse, and we’d like to carry that action into your wedding day. I seamlessly divide responsibilities with my second photographer, allowing me to deliver the best experience possible to the bride and groom. They also help me behind the scenes, so I can always keep my focus where it matters most: YOU. Whether you have one photographer or two, I assure you I will capture a complete, multi-faceted storyline of your wedding day. Forgoing a second photographer doesn’t mean you have to sacrifice quality by any means. There are, however, obvious benefits to having a second photographer – especially for large weddings or events with multiple locations. If you’re unsure about this feature, let me know. We’ll discuss it, weighing your expectations and goals, and I’ll give you my honest opinion. Delivering candid moments and capturing real expressions is so important to me, and a second photographer invariably helps me accomplish that. Note: A second photographer doesn’t necessarily mean double the photos. We’ll photograph your wedding to the fullest extent possible, review the images afterward and remove any that are blurry, repeats, unflattering, test shots, etc. A second photographer may increase the number of images taken, but not double them. The second photographer is there to assist me in gathering a comprehensive visual catalog of your wedding day and their activities will complement mine.